The second part of my Garden Review 2014 looks at the summer months, and will hopefully make you all sigh and smile as you think back to your gardens last summer! Do join in if you can. And thanks to those who already have. It’s wonderful therapy looking through bright and “flowerful” photos! June: “Although it’s barely 20°C with the odd shower passing through, I still feel like summer has arrived…” were the opening words of my first post in June. It got very hot soon after, but the earlier showers had given the garden the reserves it needed to get through a short heatwave mid-June, and three very dry weeks. 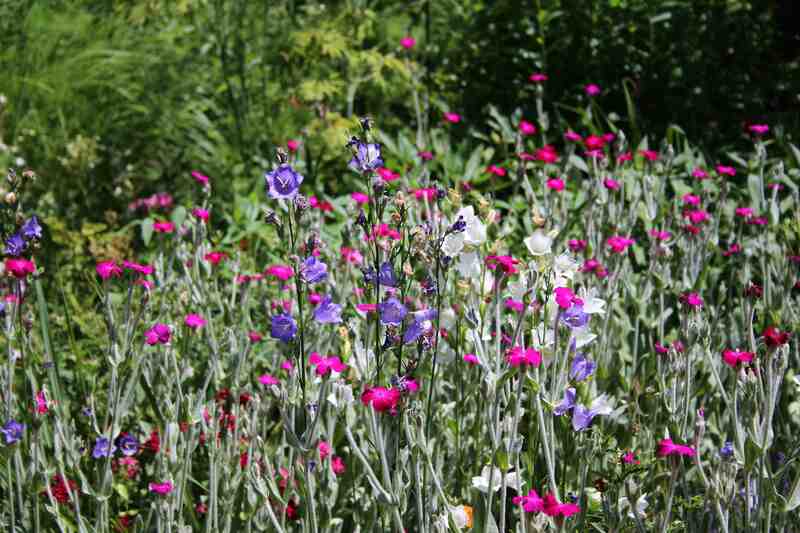 The Lychnis coronaria loved it! The Lychnis filled all the driest spots where other plants just shrivel up. (Above with Campanulas and below with Linaria). 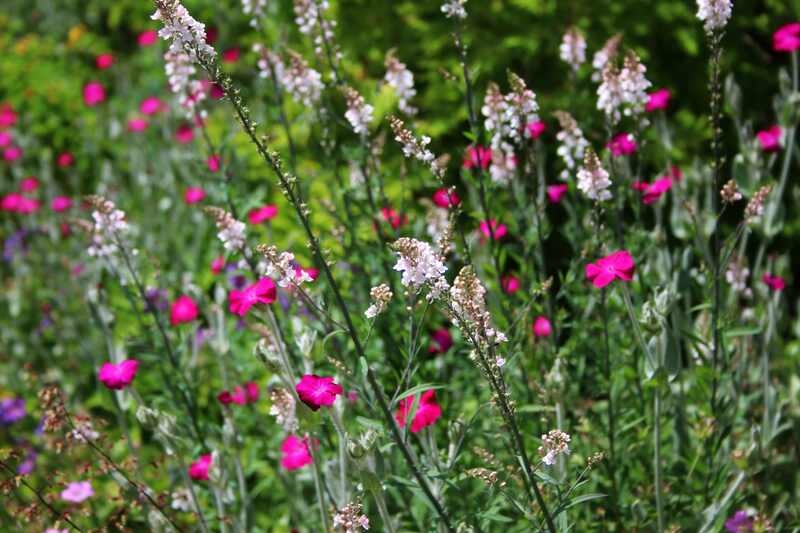 In German Lychnis are Lichtnelken – Licht is light, and Nelken are carnations/pinks… very apt. Another resilient flower that was fabulous again this summer is the Centranthus ruber. I only cut it back a couple of weeks ago – yes at the end of November – but it was still flowering after six months! Almost all my butterfly photos are on or near the Centranthus. 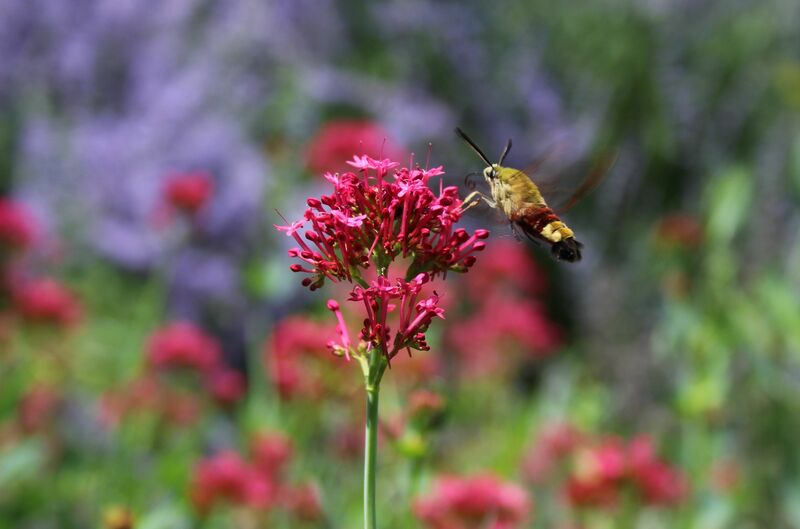 In the slideshow below you can see the Hummingbird Hawk-Moth on it. The other butterfly is a Marbled White on some pink vetch. 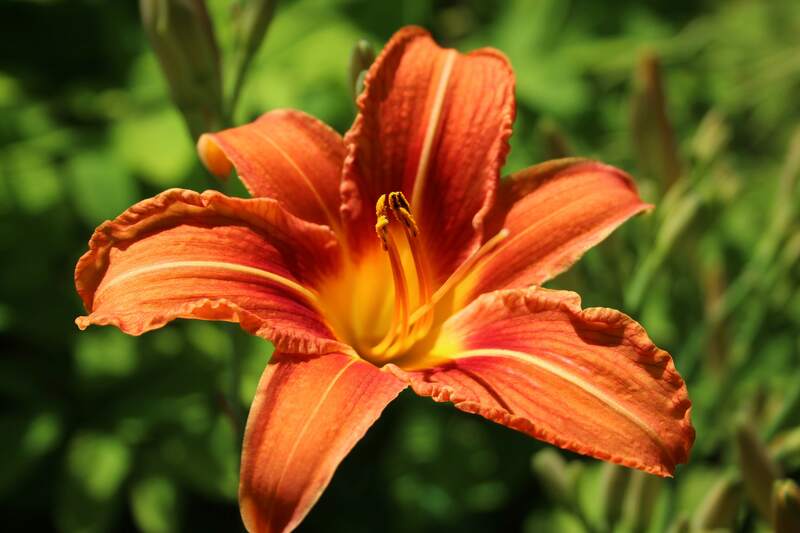 The day lilies were as gorgeous as ever, but I always forget just how much I love them. I remember a (non-gardening) visitor asking me once what they were, and then she said “I don’t like them”. I was speechless! 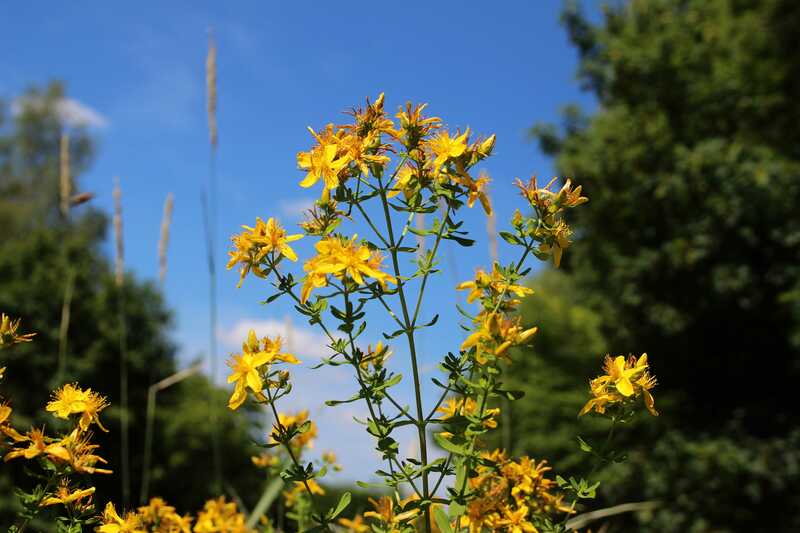 Another June favourite is the strong yellow of St John’s Wort, which brings the garden to life, and the insects love it of course. Signs of autumn were already there by mid-August… more of that in my final Review post next week. In the meantime I hope this brought a smile to your face, and I would love to see your garden reviews of 2014 too! This entry was posted in Butterflies, Garden, Nature, Plants and tagged Garden, Nature, Plants, Seasons, Summer, Wildlife. Bookmark the permalink. You make me yearn for summer, and that’s coming from a place where we still have warm days and certainly no freezing temperatures. It’s not just about climate. The summer palette has surely completely faded and the garden looks drab and needing something bright and colorful. Your photos do bring summer back and I think that although patience is still needed, it’s on my mind, too! I must admit I envy you your warmth right now, but I am enjoying a break from gardening and doing lots of jobs in the house that got neglected in summer! Doing these reviews of spring and summer have made me feel far more optimistic than usual for this time of year. We just need to look for colour elsewhere for now! Your blooms certainly put a smile on my face this cold and windy morning. I love the way your Lychnis looks in both the photographs, I think it needs planting on mass like that, I’ve been pulling mine out because it just doesn’t seem to last very long in flower and never looks like yours. The Lychnis seeded itself well the year before and almost took over that spot, but the foliage does look ugly after its first flush of flowers and after strong sun too. I still love it though and en masse it did look rather nice. I am relatively new to your blog, so it is interesting to view your garden through the year. You take some wonderful photos, I am envious of the insects you see in your garden. Thank you Brian. The butterflies were wonderful this year and I kept a butterfly diary and posted a summary at the end of each month. I even had a swallowtail caterpillar, but sadly didn’t see the actual butterfly this year! I’m glad you are enjoying the posts. The review has opened my eyes to a few things too. Winter is a good time for reflecting though! Thanks Mitza. Hope you have a nice day too! Thanks for taking us back to your summer world. Your garden has a rich variety in summer, plants and insects. Some of those photos are really breathtaking. I like you Lychnis very much. My red one keeps dying out but a white one does well. That’s too funny Cathy. I’ll try the red again too. Pretty captures Cathy I am sending you wishes for a Very Merry Christmas and an Awesome New Year! I’ve warmed up just reading your post Cathy. Fancy not liking day lilies! There are very few plants I don’t like, so I found her comment a bit strange…. Glad the summer sunshine warmed you up. We could do with a few rays of sun here too – very cold and grey today but thankfully not icy yet. PS I couldn’t leave a comment on your post for some reason, so just wanted to add that the window boxes look lovely and Happy Anniversary! How lovely to see some wonderful summer scenes on a cold day like today. It does make you long for it to be summer again. By the way, I love your icy rose bud header. Thanks Chloris. Yes, longing for some sunshine here too. Your Marbled White butterfly is a beauty! She inspired me to do my own butterflies in the garden review. I particularly liked the butterflies and moths. Interestingly, although there is a lot of Centranthus in this part of Devon, I rarely see insects on it. And mine is buzzing with life all summer! Maybe there are other tastier flowers nearby attracting the insects away? That bee-hawk moth is amazing! Aren’t they beautiful?! They look so soft, like a bumble bee, but are too quick to touch! Glorious, and I especially love the insects and how you captured them. Wow, these colours! You know that I wonder each winter: if we’re ever going to experience anything like last summer…it sounds silly, I know, but when everything looks so dull you can’t help but wonder, no? Not silly at all Annette, as I know exatly how you feel! My garden always looks dead in February still, and I just cannot believe it will ever be green again. But all that strength is under the ground just waiting for the right moment to sprout! What a great idea Cathy and thanks for the invitation to join in. There’s no doubt that looking at beautiful images of lovely gardens is very inspiring for us all. I’ve found a few of my favourites too. Here’s the link http://countrygardenuk.com/2014/12/12/summer-2014-revisited/ Roll on 2015! Thank you Gillian. Your review was inspiring too – you have such lovely colour in your garden! It was a reminder to me too – a good exercise which I will certainly have to do more often in winter! You managed to capture lots of pollinators in your summer photos, too. I love them. Your bees look different from ours. It’s fun to see the difference from garden to garden around the globe. What a beautiful review….my Centranthus ruber never seems to give up…just when I think it has died it blooms somewhere. It’s an amazing plant isn’t it… so glad I was given a few roots when we moved here. Lovely photos and such a good idea to review. We have a variety of St Johns Wort in Spain and surprise lilies. Look out for a blog about lilies in Ohio. Northeastohio garden, I think. Too many lilies there for your visitor. Thanks – I’ll have to look out for that blog. The St John’s Wort is lovely isn’t it!